A simpler, better way that puts you in control of gaining and sustaining ISO 27001 certification. As the most popular standard in the world for managing information security, ISO 27001 benefits small to large organizations alike. Some organizations adopt ISO 27001 to implement best practice, while others obtain certification to add credibility to their processes and strengthen their brands. Certification not only assures customers and other stakeholders, but it can also be a competitive advantage. For many industries, certification may be a legal or contractual requirement, while others may consider ISO 27001 as “basic hygiene” of a well-run modern organization, or it is simply a necessity to compete in the global arena. 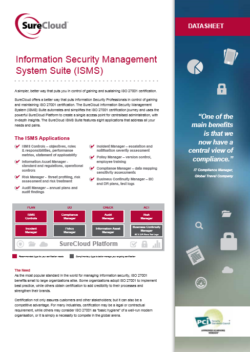 Find out more about ISMS Suite here.